This is something I've been tracking for years ... this graph shows existing home sales (left axis) and new home sales (right axis) through July. This graph starts in 1994, but the relationship has been fairly steady back to the '60s. 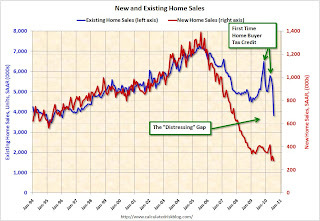 Then along came the housing bubble and bust, and the "distressing gap" appeared (due partially to distressed sales). Note: it is important to note that existing home sales are counted when transaction are closed, and new home sales are counted when contracts are signed. So the timing of sales is different. The two spikes in existing home sales were due primarily to the first time homebuyer tax credit (the initial credit last year, followed by the extension to April 30th / close by June 30th). There were also two smaller bumps for new home sales related to the tax credit. Since new home sales are reported when contracts are signed, the 2nd spike for new home sales was in April and then sales collapsed in May. The 2nd spike for existing home sales was in May and June, and then existing home sales collapsed in July. I expect that eventually this gap will be closed. However that will only happen after the huge overhang of existing inventory (especially distressed inventory) is significantly reduced.